Koreans eat so much of this super-spicy condiment (40 pounds of it per person each year) that natives say "kimchi" instead of "cheese" when getting their pictures taken. The reddish fermented cabbage (and sometimes radish) dishmade with a mix of garlic, salt, vinegar, chile peppers, and other spicesis served at every meal, either alone or mixed with rice or noodles. And it's part of a high-fiber, low-fat diet that has kept obesity at bay in Korea. Kimchi also is used in everything from soups to pancakes, and as a topping on pizza and burgers. Why to try it: Kimchi (or kimchee) is loaded with vitamins A, B, and C, but its biggest benefit may be in its "healthy bacteria" called lactobacilli, found in fermented foods like kimchi and yogurt. This good bacteria helps with digestion, plus it seems to help stop and even prevent yeast infections, according to a recent study. And more good news: Some studies show fermented cabbage has compounds that may prevent the growth of cancer. What to do with it: There's no need to make your own; just pick it up in the refrigerated section of your grocery store or an Asian market for around $4 per 32-ounce jar (Sunja's is one popular brand). You can wake up your morning by scrambling eggs with kimchi, diced tomatoes, and mushrooms. Use it as a wrap filling or to top a baked potato. Or try Spicy Beef and Kimchi Stew, which won our test kitchen's top rating. 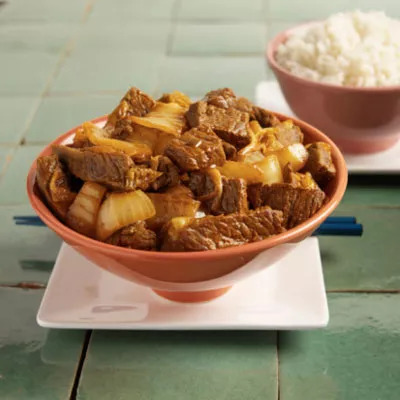 This recipe is high in sodium (due to the soy sauce and the kimchi), so if high blood pressure is a concern for you, omit the soy sauce, which will bring the sodium down about 200 milligrams. Sign up to receive our best tips, workouts, recipes, and more. What Exactly Are Digestive Enzymes—and Do You Need One?